Normally, in the mornings, I take a picture of Faith's lunch in my study. If I open the blinds and put on the correct lights, the picture is decent enough. This morning, she and Daddy were running behind, so I grabbed a photo in the kitchen. This is why I don't take photos in there. The lighting is lousy. And she was supposed to have pork dumplings but I didn't have enough time to steam them. 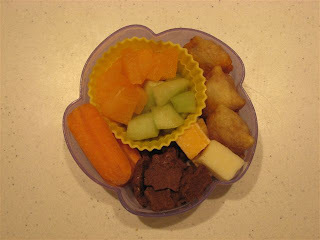 She took little pizza bites (because I could microwave those), sliced melon, carrot sticks, cheese cubes and Teddy Grahams. I'll have to wake up in time to steam the dumplings on Friday, and take a picture in a better lit room.